Chairs were flying, billboards were turn up and hurled, and intimidating chants roared out as aggression and adrenalin boiled. Dozens of testosterone-fuelled men attacked each other on the sidewalk before police arrived to break it up, but it wasn’t a situation for the fainthearted. Something doesn’t seem right, however: this is not on a grimy backstreet in Manchester or a crime-ridden township in Johannesburg, but a sunny suburb of Newark in New Jersey. The fans don’t follow Liverpool, Red Star Belgrade or Galatasaray, but the New York Red Bulls and New York City. They didn’t even know each other a year ago, not on the pitch at least, but they aren’t wasting time introducing themselves. Not everybody subscribes to the ferocity and legitimacy of the antagonism the two groups of fans display towards each other. Michael J. Agovino is a native of New York and the author of the fascinating chronicle entitled The Soccer Diaries: An American’s Thirty-Year Pursuit of the International Game, and he told me he isn’t convinced. “It feels manufactured, in my opinion. Developing a rivalry, and dare I say it hatred, takes time and bit of suffering. That doesn’t happen in a season.” As his book title suggests, he has been following football for over three decades now, and grew up on a diet of World Cup highlights when it was a distant, exotic, unique product, so some aspects of the sport’s ultra-modern incarnation can’t compete. “I’ve seen the YouTube video, but it felt fake, like wannabe English hooligans,” he said, referring to online footage of the scrap mentioned above. “But hey, marketing can be a powerful tool, and Americans are the masters of it. People turned out for the derbies this past season, so what do I know?” Already it is clear this is no ordinary derby; to grasp the nuances of a relationship that has only just begun, we must dip further into the past, beyond the birth of the very nation in which it takes place. Nathaniel Courthope breathed in the heavy smell and finally allowed himself a moment of release. For months he had risked his life with no certainty of ever returning home, and had lost a number of his companions along the way, but he could at last sense tangible proof that his epic struggle was almost at an end. For the smell that drifted past him was the sweetest he had ever smelt; it was of nutmeg, the most valuable commodity in the world, and he was within touching distance of securing its only source in the world for the British Crown. It is hard to imagine, but what is now a commonplace spice was once more valuable than diamonds or gold; on the streets of London, nutmeg was sold for up to 60,000 percent its value in the 16th and 17th century, due to the fact that its only known source was on one of the least accessible places on earth, the tiny island of Run in the Banda Islands in what is now Indonesia. Portuguese sailors were the first Europeans to tentatively set foot in the area, but it wasn’t until Courthope and his intrepid pioneers settled a century later that a permanent monopoly was secured on the trade that had previously snaked its way through India, Constantinople and Eastern Europe. The infamous Dutch East India Company was a major rival to the British fleet at this time, and they were not keen to just watch by as their British contemporaries grabbed the enormous wealth for themselves. A bloody struggle ensued through the 17th century, until at the denouement of the second Anglo-War it was agreed that the Dutch could formally keep Run. In exchange, they agreed to cede control of another island far away, surrounded by unappealing marshland that bore little prospects of a profitable existence: Manhattan, and with it, the Dutch colony of New Amsterdam. New York, as the growing settlement was renamed, would grow into one of the wealthiest cities in the world, while the island of Run is not even recorded on all world maps; it’s funny how things turn out. Over the course of its history, the city has seen countless millions of migrants from across the globe settle amongst the bright lights of opportunity, all bringing with them a piece of culture from their original home countries which have formed the character of the modern metropolis we know today. American pursuits such as baseball had been well established since the mid-1800s, but one sport that truly united the migrant population after the turn of the 20th century in the city was football. Unlike many other countries with strong links to British industry or colonialism, although it was hugely popular with those of European and Latin American descent, it did not initially blossom as an organised sport, although it didn’t die out completely. The struggle to gain recognition in a city that houses four of the world’s 20 most valuable sporting brands is a tough one, but in the United States, with the best aggressive marketing tactics and razzmatazz, anything is possible. In the 1970s, the New York Cosmos were founded by, appropriately, the president of Warner Communications, the entertainment company that has produced hundreds of Hollywood movies, Ahmet Ertegun, the Turkish-American record producer who shot Ray Charles to fame, and Ahmet’s brother Nesuhi. 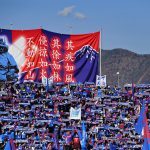 Despite having 16 different nationalities in the first season, they only attracted an average attendance of 4,500, and after three years, this figure had dropped to 3,500 as they jumped to their third different stadium in three years. Then, in 1975, came the seismic moment that truly established the global brand of the Cosmos, and the sport on the conscience of the New York public – Pelé signed. 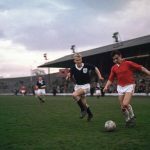 Instantly, attendances tripled, rock stars and actors began queuing up to be seen as the show moved first to Yankee Stadium, then to Giants Stadium, and soon a whole glittering array of international footballing icons swarmed to the hugely lucrative spectacle. But was this all it was? A spectacle, without substance? It was certainly a long way from the earlier games organised by immigrants, as the late football historian David Wangerin described in his book Soccer in a Football World: The Story of America’s Forgotten Game, 40,000 fans regularly watched an Austria Jewish club side as far back as 1927 at the Polo Grounds in Harlow, across town from where Agovino’s father was born. Even at the height of Pelé’s star-spangled Indian Summer in the city, attendances rarely passed that mark on a regular basis. The decision to award the 1994 World Cup to the US was curious; it was taken in 1988, three years after the NASL had collapsed and 38 years since the national team had qualified for the tournament, so the event was effectively the last chance to reignite interest in the sport. If anywhere was going to benefit from this surge of football it was New York, with its cosmopolitan fabric lending itself to a diaspora of footballing heritage via second and third generation immigrants. Upon the advent of Major League Soccer in 1996, the city hosted a founding member of the new league, the New York/New Jersey Metrostars, with Roberto Donadoni their marquee signing. The very concept of marquee signings has caused friction between observers of football in the States, with many disappointed, even angry, that club owners are keen to attract ageing stars ahead of developing homegrown youth in a responsible environment. New York City have, for example, brought in Frank Lampard, Andrea Pirlo and David Villa at the ages of 37, 36 and 33 respectively, and while they guarantee an initial surge of paying punters through the door, the question remains whether it is a sign of the progress the league has made, or an indictment of the commercial priorities over player development. Without question, the flurry of excitement at Chelsea’s record goalscorer arriving was tempered somewhat by the extension of his stay at parent club Manchester City, but the real acid test will be to judge the standard, age and motivation of star signings over a generation, not just a few years. Sebastian Giovinco’s stunning debut season with Toronto FC at the peak of his career is perhaps a signing of even greater significance than Lampard, Pirlo and Villa. Omar Saleem spent time as a coach with the New York Red Bulls and he has a unique perspective on the coaching conditions and player development, having worked with top flight clubs on both sides of the Atlantic. “The atmosphere is certainly conducive in that facilities were largely very good. The problem is that coaches are often devoid of proper training and that filters down into the way the young players are developed. The raw talent and hunger is there, but it’s vital that coaches follow proper procedures to train these players to be confident on the ball, understand the various roles on a football pitch and be as technically strong as their European and South American counterparts. “There’s no question soccer can compete alongside the traditional major sports but the key is retention of players beyond the age of 13. That comes down to coaching, developing a love for the sport through training sessions and encouraging youngsters to watch it on TV.” The key word at this stage is potential; but MLS will be two decades old next year, and it is still relying largely on the draw of foreign stars and the development expertise of overseas coaches. None of the development counts, of course, unless there is a fan base. To a Londoner, it may sound odd to be concerned about introducing a second top flight club to a metropolitan area of over 20 million inhabitants, but not everyone was sure about the success of introducing New York City to the MLS. After all, Los Angeles failed to sustain Chivas USA, despite their huge following of Hispanic fans, due to the competition from the immensely popular and star-studded LA Galaxy. Before the return derby between the Red Bulls and NYCFC, major networks filmed the newer club’s fans en route to Red Bull Arena in full voice, proudly reminding anyone who cared to listen that they are based inside the boundaries of New York City, whereas Red Bulls call Harrison in New Jersey their home. The relationship has feint echoes of Manchester City mocking Manchester United fans for following a team based in neighbouring Salford, which is appropriate given the backing the blue Mancunians give to NYCFC. One aspect that neither club can criticise each other for is the enormous wealth behind them. Manchester City are owned by Sheikh Mansour bin Zayed Al Nahyan, whose £17 billion fortune has bankrolled the English club to the tune of over half a billion pounds, and through the football club he has established a unique partnership with the MLS franchise as well as a similar project in Melbourne. The Red Bulls take their name from the Austrian drinks manufacturing giants, and have been treated to the presence of outstanding stars such as Rafael Márquez, Juan Pablo Ángel, Thierry Henry and Tim Cahill amongst others in recent years. There is no use sniffing at the wealth behind the franchises: just to meet MLS stipulations, hopeful bids must pay an entry fee of $100 million just to join the league, and that is before they commit to building a football-specific stadium and shelling out salaries for designated star players. Without phenomenal backing, the clubs would not survive in the environment they wish to enter, nor would they be able to catch up on their global counterparts quickly, something many are anxious to do after commissioner Don Garber stated his target for MLS to be one of the world’s top leagues by 2022. “Traditional rivalries take time, but everything in US soccer is in fast forward,” explained Saleem. “The fans want a rivalry, yes, but logically there isn’t really much reason to hate each other’s club unless you’re a New Yorker and you hate New Jersey and vice versa. Major League Soccer as an organisation will do everything to build it up as a major rivalry. Personally I don’t think it is yet. I think history makes a rivalry.” However galling it may be to purists, the bigger the stage, the bigger the stars, the bigger the rivalry will become – in theory at least. There is certainly no guarantee that this maddening show will be a long-term success, but you would be a very bold man to bet against it.